One of the must-visit resorts for ski enthusiasts. Vail is one of the biggest ski resorts in North America, and is definitely recommendable for the advanced skier. When having your ski holidays in Vail ski resort, chances are you are unlikely to run out of great places to ski. The Vail is a top-rated ski resort in the US. The resort has received an abundance of investments over the last decade, and accompanied with this inflow of cash, have resulted in a severe upgrade in material and infrastructure. The resort gets a lot of investment in improving the services and infrastructure. The wealth of investments has provided Vail Ski Resort with some of the best chairlifts and well-groomed pistes and runs. The entire ski season, the pistes and the slopes receive individual attention from the administration of the resort. The ski season in the breathtaking Vail mountain begins from the middle of November and continues towards mid-April. The shiny bright blue skies for almost all year round is one of the best features of this popular ski resort. The awe-inspiring terrain together with the natural beauty of the nearby Swatch and Gore ranges offer a spectacular skiing experience. The vail has over 5,289 acres of skiable terrain, well-groomed by sophisticated snow machinery. Vail has a sophisticated lift system with several high-speed quads. The resort is well-connected thanks to the 31 lifts. Vail has two gondolas, three high-speed sixes, 14 high-speed quads, one quad chair, two triple chairs, and nine surface lifts. The lift capacity can cater for more than 53,000 skiers every hour. Vail continues to upgrade the lifts and gondolas to carry more skiers each season. Vail has one of the most sophisticated systems of lifts. The lifts can take skiers back from the base area of the Blue Sky Basin to multiple areas within the resort, by taking the Teacup express. However, unfortunately, the Teacup express is also one of the most overcrowded lifts in the resort. The average waiting time could exceed one hour, so be advised to time your return accordingly. The Eagle Bahn Gondola leaves daily from the freshly revamped Lionshead village. This gondola takes skiers to the Eagle’s Nest, the home to Vail’s activity center located at the mountaintop called Adventure Ridge. 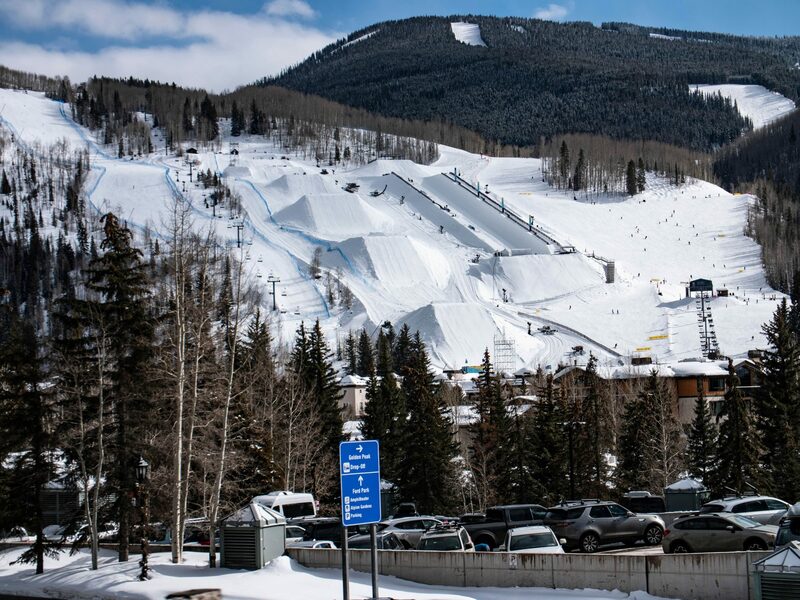 The skiers can head on to the Golden Peak, the eastern base camp, the Superpipe and the Terrain Park. The Riva Bahn takes skiers towards the middle of the Vail mountain. The Riva Bahn takes visitors to the legendary back bowls and Blue Sky Basin. Due to the popularity of the resort expert huge lines and an average waiting time of 15 minutes on the lifts and gondolas. The Vista Bahn and the Eagle Bahn gondola are especially notorious for their long lines. To avoid massive crowds and long lines, take the Riva Bahn Express that will take skiers out the Golden Peak or the Born Free Express from the Lionshead base. These lifts are perfect for getting access to the entire mountain without waiting in lines. The Epic Pass will give skiers a chance to have the best value for their money in the industry. This one pass will offer skiers access to other resorts near Vail. By getting the Epic pass, you have until April in the current season to enjoy full access to over 43,000 acres of skiable terrain stretching across 14 premium resorts in the US. The Epic Pass will get you to Vail, Beaver Creek, and Breckenridge. Vail is home to a wide range of terrain and slopes. The resort has over 5,289 of well-developed and excellent machine groomed trails. Vail is home to seven Back Bowls, a legend among skiers. The Back Bowls are span across seven miles. Vail is a versatile resort that brings something for every type of skier and snowboarders. The Vail has plenty of options for beginners. The sheer size of the mountain initially intimates most beginners. The best choice for beginners is to take the Eagle Bahn Gondola, to the Eagle’s Nest. This terrain is perfect for wobbly first timers, giving them confidence and excellent views of the massive mountain. The next stop for beginners is to head to the Eagle chair. Once on this trial, beginners can ski down and take practice laps on the Little Eagle Chair. When you are confident enough with your skills, head towards the Practice Parkway for more skiing. Follow the route down towards the Ledges. It has an extended run that has pockets near the trees for resting. The legendary Black Bowls of the Vail and the Blue Sky Basin are not recommended for beginners. There are other options for beginners to refine their skiing beginning at the front side of the Vail from the Golden Peak leading to Lionshead. The primary area of the Vail’s Front Side is ideal for intermediate skiers. An abundance of easy cruising trails is available. For more challenging trails intermediate skiers can head to the black diamond but rather easier slopes on the Back Bowls. If the weather conditions are suitable; intermediate skiers can practice their powder skills on the ungroomed Blue marked trails in the Back Bowls. The Vail offers a unique opportunity for intermediate skiers to test their skills on the same terrain designed for advanced skiers. Areas in the Back Bowls and the Blue Sky Basin lets skiers choose trials with gradient, which suits individual confidence and skiing style. The longest trail in Blue trails is the Riva. The Riva is four miles long, and one of the most challenging among the blue marked slopes because of the steeper segments and many bumps. The Game Creek Bowl located at the far right of the Front Side is another famous blue trial. One of the best way to explore the Vail mountain as an intermediate skier is to reserve a spot in the Meet the Mountain Tour. The Tour begins at 9:15 am, taking skiers from the Eagle Bahn. An expert guide will take the skiers to some of the best trials. The Vial is a powder paradise for expert skiers. Several black marked trials give expert and advanced skiers a chance to experience the great powder in three significant parts of the resort including the Front Side, Back Bowls, and the Blue Sky Basin. The Front Side is one of the most underrated ski slopes for expert skiers. The Front Side offers some of the most massive black diamond runs that Back Bowl does not provide. The Northwood Express takes skiers to experience the black marked trials at the top of the lift. The Gandy Dancer is one of the most important trails. The most challenging path is the Prima Cornice. The Riva Ridge is another ideal ski trail for those who love challenging black slopes. The Blue Sky Basin is one of the new additions to the many black trails in the resort. The Blue Sky Basin includes two separate peaks served by three major high-speed quads. The Skyline Express Lift is one of the most easily accessible lifts by skiing past the Teacup Express located at the base of the Teacup Bowl. The runs located off the Skyline Express are narrow with lengthy mogul runs. This trial has some of the best black trails in the entire resort that challenges the best of skiers. The two significant runs that go back towards the Earl’s Express and Champagne Glade are extensive and a favorite among skiers. Located right opposite the Earl’s Express is the Lover’s Leap trail. This trail is a little cornice that builds up on top of the Skyline Express. The drop is the most challenging part of the Lover’s leap trial, and it possesses an excellent challenge for even the most experienced expert skiers. The Pete’s Express is last on the Blue Sky Basin. The trails in this part are slightly gentler than other trials. The handful of black diamond trials in this area takes skiers into similar territory as Lover’s Leap. Vail is a very popular ski resort in North America. The popularity of this resort means large crowds and a very happening après and nightlife. Après is the best way to end a perfect day at the slopes of Vail. The resort has several choices for perfect après. From mellow evenings to wild, loud parties, the resort is not short of options for every taste. Follow this guide to the best après ski activities in Vail to enjoy with your friends and family. There is no better way of ending a spectacular skiing day with a relaxing après. Los Amigos gives you a perfect option for your après. The Los Amigos is one of the most popular après spots in the resort. Enjoy delicious cocktails and tequila with authentic Mexican food. The Garfinkels is located right at the base of Lionshead on the Slopeside. Since years, the Garfs is a prime après location for skiers and tourists. Enjoy drinks with your friends on the deck. The Garfinkel has a classic sports bar vibe that attracts skiers for a perfect après. The Express lift is another locals and skier favorite for après. The Express lift have some special discounts for après each season. The Tavern on the Square is a popular spot for après. This is the perfect place to be pampered by the friendly staff. This joint offers some of the best cocktails in the resort. The Tavern has a generous selection of wines, champagnes, and good quality beers. Skiers head to this bar for a memorable après with old and new friends. The Red Lion is a combination of a restaurant bar and a nightclub. This three in one location is necessary to visit for a tour in après. This is a popular spot for those who want to party hard after the adventures on the slopes. The crowd goes wild towards late night, and the parties here are never-ending. The Red Lion opens at 11:00 am and closes late in the night. The Remedy bar is another local and skier favorite as it offers spectacular views of the Vail Mountain. The perfect location to unwind after skiing. The bar serves out of this world; cocktail, beer, and wine. The bar has live music and a large 165-inch screen that display major sporting events live. The bar timings from Monday to Friday are 11:00 am to 12:00 am. Saturday to Sunday 10:00 am to 12:00 am. The Bart’s and Yeti’s is the one stop for après among skiers. It is an old bar in town with a rustic no-frill drive bar feel to it. The best part about the Bart’s and Yeti’s is that you can bring your dog along too. One of the best dog-friendly bars in Vail is a popular spot for après. There is nothing better than getting a free drink at your après on weekends. With no referencing to the movie "The Big Lebowski", the bar is also known as “The Dude” among the locals. Watch your favorite sports, play pool or just unwind in the Altitude bar with a good selection of drinks. The Vail is one of the most popular ski resorts in North America. The resort is one of the biggest and greatest when compared to other neighboring ski resorts in Colorado. Vail has other winter activities for non-skiers and skiers to enjoy. Apart from the enormous skiing adventures on well-groomed slopes, you and your family will enjoy other winter activities mostly at the Adventure Ridge. The Adventure Ridge is a massive snow park the size of a football field. Take the Eagle Bahn Gondola early morning to avoid the crowd. The Gondolas at the vail take skiers to the majestic slopes of the Vail Mountain, another role that the gondolas play is to take tourists on scenic gondola rides across the valley. Reserve a trip at the Eagle Bahn gondola located in Lionshead. Keep your cameras ready to make sure you don’t miss a single scene from the spectacular views. After the spectacular scenic tour in the Eagle Bahn Gondola, you can relax and unwind at the Bistro Fourteen. The scenic gondola rides are offered free after 3:30 pm. The Nature Discovery center arranges free guided snowshoeing tours. The tour is educational and full of fun. This is your chance to learn about the nature and the ecology of the Vail, a fun activity for the whole family. Another snowshoe tour is available in the evening, where you can learn about the nocturnal habits of the animals. Experience the peace and tranquility of the resort with snowshoes. Take a guided tour with your family on a snowmobile to experience the resort from another angle. Take the snowmobile yourself or take a guide with you to enjoy the serenity of the Vail. The snowmobile rides are available for children. The price is $25 for a 30-minute ride. Tubing is a favorite activity for everyone. Vail has some of the most outstanding tubing slopes in the region. Choose a long or short run depending on your choice. The Adventure Bahn takes tourists to the top for tubing. Adults for tubing must accompany children. The price for tubing is $43 for 3 runs and $75 for unlimited runs. Ski Biking is a popular nighttime activity. The tours are especially offered at Vail resort only. The Ski bike experience begins at the Adventure Ridge at the Eagle’s nest. You will need to board the Eagle Bah Gondola to reach the tour destination. Take the bike on the snowy tracks to experience the beauty of the Vail.